White or white blend. Moderate, raspberry fragrance. Average diameter 4″. 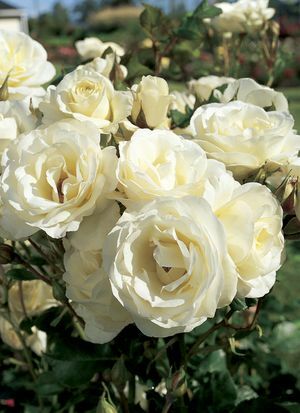 Medium, full (26-40 petals), cluster-flowered, in large clusters, flat, high-centered bloom form. Blooms in flushes throughout the season. Pointed, ovoid buds. Tall, thornless (or almost), upright, well-branched. Medium, glossy, dark green foliage.